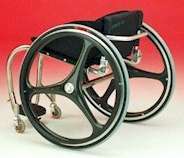 Most major wheelchair manufacturers now feature a few titanium models as part of their product lines. Though this exotic metal can add up to $1,000 to the retail cost, it has natural shock-absorbing properties, resists scratches, and is far easier to lift, carry and push. The stylish 11-pound titanium machine above is the product of Canadian craftsmen at the Better Made Wheelchair Company in Red Deer, Alberta. 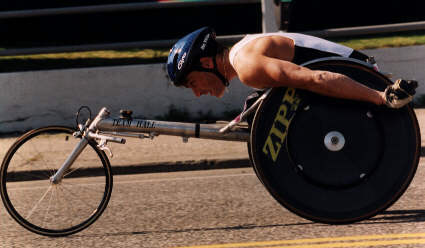 TiSport has fielded a full line of durable, attractive rigid and folding titanium wheelchairs for everyday and competition use, weighing in at between 15 and 22 pounds. But titanium isn't the only way to make a chair light and lively: marvel at this sleek 17-pound model handcrafted of aluminum by New Halls Wheels of Cambridge, Massachusetts, which sadly is no longer in business. A new British product, the PDQ PowerTrike, is a rechargeable, battery- powered front-end attachment for almost any wheelchair that allows the user to travel 15 to 20 miles at a top speed of 11 mph. 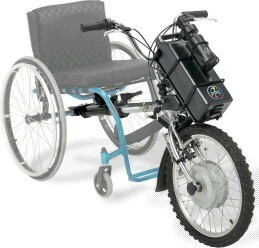 Find out more at the PDQ Mobility website. JOHNSON & JOHNSON's IBOT, shown below, after extensive test trials by the FDA, is a revolutionary gyro-controlled stair-climbing, standing wheelchair designed by award-winning inventor Dean Kamen . Though the first generation model is awkward- looking -- and very expensive-- IBOT may have enormous potential. J&J bought and tried to market a sleek but heavy "manual-looking" power-assist chair, the iGLIDE, but withdrew it after a year or so, "to focus on iBOT". Britain's Cyclone markets a new Swedish-built All-Terrain Cart, above, that combines dunebuggy and wheelchair, for those who want a motorized off-road experience but have limited mobility. Even quadriplegics can drive this one. 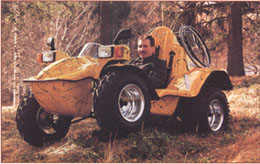 KUSCHALL's rugged TERRATREK, shown at left, is one of several go-anywhere, do-anything innovations in the self-propelled off-road category. Less glamorous, but no less useful: some chair users want or need extra leverage for pushing their chairs uphill, or braking them when going downhill. Check out The Wijit, an innovative wheel control and steering device, shown below. 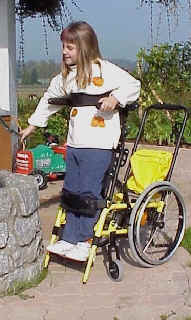 German engineers have come up with several devices to help wheelchair users enjoy greater mobility. One is the Kempf Accelerator Ring for automobiles, far right, an interesting departure from traditional hand controls used by paraplegics. 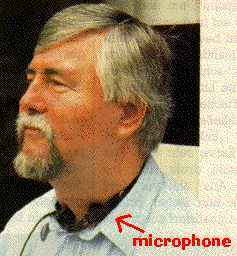 The other device is the Katalavox voice-activated control for powerchairs, using a throat-mounted microphone. The LEVO standing chair from Switzerland rolls like a manual rigid-frame everyday chair, then rises to the occasion to lift its user to eye-level for stable stand-up tasks through simple gas-assisted gears. It won't climb stairs like the IBOT, but it raises the bar for livability in everyday chairs that offer an elegant solution to a recurring daily need. And here's the German-built Tunkers Butler, a clever machine for those whose work requires a lot of up and down activity -- a combination power chair and lift that moves horizontally and vertically, mounted on a very small base that allows the user to get close to desks, bookshelves and counters. 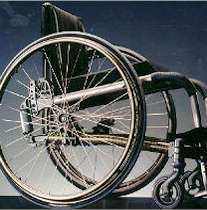 Several wheelchair makers recently introduced 'easy-riding' models with cushioning devices built in. The market has yet to determine which is the preferred design. Others are sure to follow . . .
COLOURS was first to the market with BOING, a spring- cushioned model that had the field all to itself for awhile. 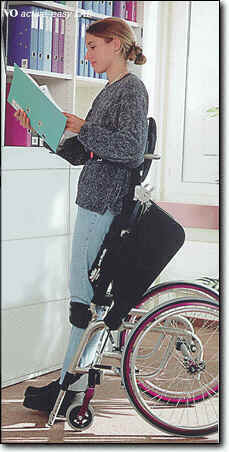 FROG LEGS came next, with a polymer shock absorber for front casters, available for any wheelchair. 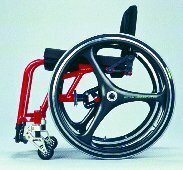 INVACARE incorporated four independently activated polymer shocks on its Action/ TopEnd model, the TERMINATOR SS: Frog Legs for the two front casters, and a Quadra-Pivot ThudBuster for each of the rear wheels. 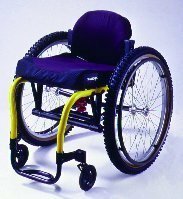 QUICKIE division of Sunrise Medical used a slightly different approach on its XTR model: a single 'RockShox' spring device, centrally mounted beneath the seat, cushions both front and back wheels. 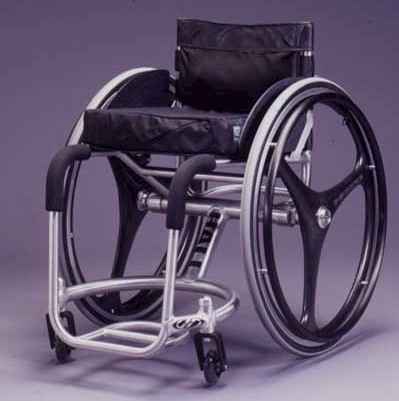 EVEREST & JENNINGS, the early pioneer of wheelchair design, mounted rear polymer shocks right behind the seat of the titanium BARRACUDA chair and on several other models of their sports machines, no longer available. 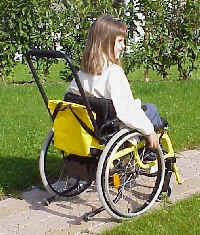 Some wheelchair dealers have websites showcasing new products for persons with a need for wheels. Here are links to two of the better ones . . .